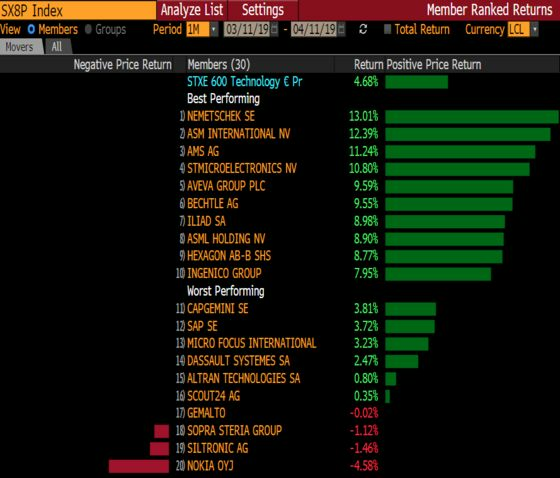 (Bloomberg) -- Yes, investors still seem upbeat during this indecisive period for European equities. As mentioned in an earlier Taking Stock column, even a flurry of profit warnings have not soured the mood. Now, tech companies might have to show some serious growth prospects to justify their current valuations. Small wonder perhaps. 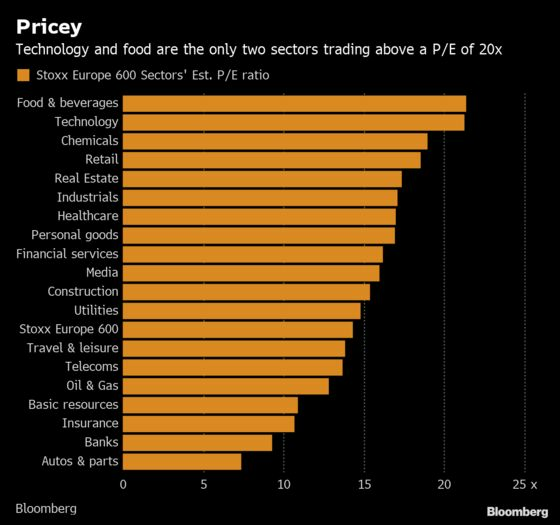 The Stoxx 600 Technology index (SX8P) is up a punchy 19 percent this year as one of the market’s outperforming corners. Temenos kicks off the earning season next Tuesday for the sector that’s now the second-most expensive in Europe. The sector trades at more than 20 times expected earnings. 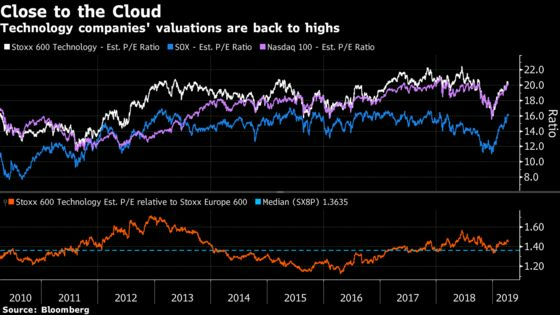 At the same time, European technology’s relative price-to-earnings ratio has stayed above its long-term median for some time. It’s not that surprising then that Credit Suisse strategists downgraded semis to benchmark this week, arguing that relative P/E have reached levels from which the sector has underperformed about 75 percent of the time. Credit Suisse remains overweight global tech, though. One thing to note is that European tech returns haven’t been quite as strong as their U.S. peers. The lack of big internet players partially explains it, but not entirely. Slower growth and a series of profit warnings might have made it difficult for the region’s shares to keep pace. Also, in terms of global positioning, the U.S. industry is one of the most crowded trades, with cumulative flows into the biggest tech exchange-traded fund (QQQ US) almost back to 2018 highs, according to Credit Suisse. Looking at chip shares in particular, outlook cuts from Infineon, Siltronic and others didn’t stop names such as STMicro, Infineon and AMS from being among the best-performing stocks in April. Several semi companies are even up more than 30 percent this year. A number of analysts, however, have started to doubt the sector will live up to expectations in their results, especially with near-term macro uncertainty. For technology hardware, Barclays expects the first quarter to be similar to the previous one: in-line with a more cautious outlook. They maintain a positive view for the year, but the earnings season might prove tricky. They’re particularly cautious on Infineon, a pricey stock that has already warned twice this calendar year. By contrast, ASML is their top pick. The Dutch company is one of the most loved by investors because it’s a key supplier of new extreme ultraviolet lithography machines, which are carrying high expectations. 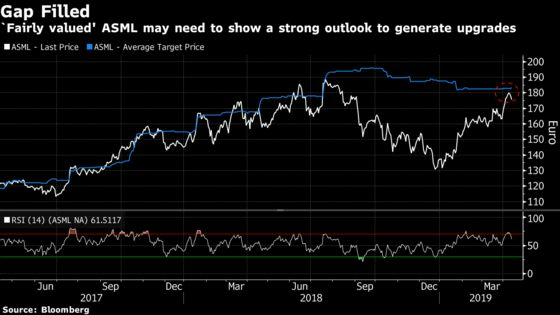 The Bloomberg analysts’ consensus is still positive on the shares, although ASML has almost filled the gap against the consensus price target. Finally there’s the cloud. Germany’s SAP accounts for 25 percent of the SX8P, so sentiment toward the stock is very important. The departure of its head of cloud business is likely to bring disruption to the key activity of the company and SAP was downgraded by HSBC and UBS this week. Suffice to say it’s fallen significantly recently. Some thoughts ahead of the earnings season. In the meantime, Euro Stoxx 50 futures are trading down 0.1% ahead of the open. Watch oil and oil companies as crude rose again overnight with futures traded in New York set for their sixth week of gains, the longest weekly winning run since 2016, after fighting in Libya added to potential supply disruptions. Watch carmakers after EU ambassadors have now given the go-ahead for talks with the U.S. aimed at keeping at bay the threat of American automotive tariffs, officials with knowledge of the decision told Bloomberg. Watch banks as JPMorgan Chase & Co. kicks off quarterly reporting by large-cap banks. The update will be seen as a marker for the global financial sector, while investors more broadly will scan the report for any hints of a recession. 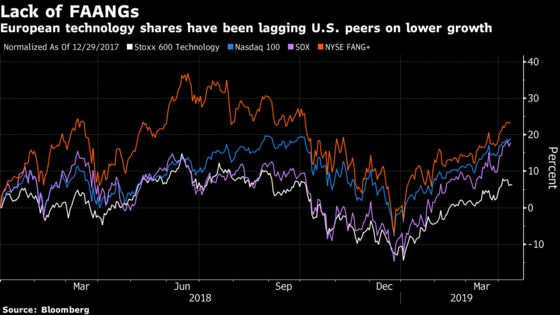 European earnings really get going next week, and stocks are likely to be “much more sensitive” to bad news given the year-to-date equities rally, according to analysts at Morgan Stanley. Entertainment One’s acquisition of Audio Network will be neutral to RBC’s PT for the U.K. TV and film producer, but under the hood it will strengthen the firm’s position in the music market and improve its growth and free cash flow profile. The perception of Eutelsat as having the same structural issues as peers Intelsat and SES but without the C-Band attraction creates a good entry point for shares, Berenberg writes in a note upgrading co. to buy from hold and pushing PT up to EU19 from EU18.30.